DBHIDS’ new toolkit is designed to support behavioral health treatment agencies with the process of integrating peer providers into their service settings. The Peer Support Toolkit incorporates many of the promising practices and resources that have emerged during the last decade of Philadelphia’s recovery-focused system transformation effort. Tools in this kit are designed to help agencies to recruit, retain, and effectively deploy people in recovery in a variety of peer support roles. The resources and information provided is relevant for executive leadership along with supervisors and peer staff. The toolkit is structured as an interactive PDF that presents key information in brief reads, yet preserves your opportunity to delve deeper into subjects — as your time and interests dictate — with just a click. It is organized in four modules, each addressing specific implementation issues relevant to agencies in various stages of integrating peer support services. The interactive PDF format allows easy navigation among sections of the toolkit. In addition, many of the tools are actually forms that can be filled out in the PDF. All pages of the PDF are printable. The toolkit performs best when the PDF is downloaded to your device and opened in Adobe. To download the PCCI Peer SUpport Toolkit, click the image of the report below. To learn more about the Peer Support Toolkit, be sure to take advantage of a quick tutorial in this YouTube video. For further information, access this list of Frequently Asked Questions concerning the Peer Support Toolkit. 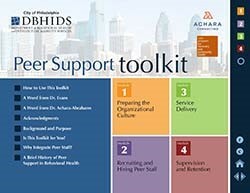 Enjoy using the Philadelphia DBHIDS Peer Support Toolkit, and be sure to provide any feedback by emailing the Peer Culture and Community Inclusion Unit at DBHIDS.PeerCulture@phila.gov.